I really don't know what else to say, but I know that I'm terribly, terribly sorry. I know I shouldn't be like this, I shouldn't have ever been like this to you. But I knew I had to leave. I never should have fallen for you. I love her, but I'm afraid I love you, too. Yes, I love you. All this time I might have been scared to tell you, only because I knew you wouldn't feel the same. We agreed on a fling, on a time to be together just enjoying the company of each other. But seeing you like this, here again in our special place, just like it has been on all those windy nights, my heart just keeps on pounding. There's just something in the way you tuck your hair behind your ear, Ellaine. I don't know. But in three full (and blissfully long) seconds, i knew I'm in love. 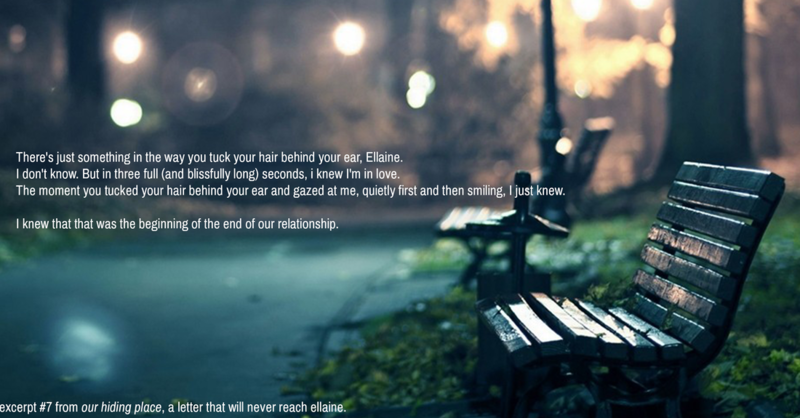 The moment you tucked your hair behind your ear and gazed at me, quietly first and then smiling, I just knew. I knew that that was the beginning of the end of our relationship.